Surname Saturday: Watercutter, Waterkotte, and Sanders? Mary Watercutter Knob (1878-1965) was the maternal grandmother of my husband's paternal grandfather, Walter Schroeder. Mary was the granddaughter of Ferdinand Waterkotte, born 26 December 1809 is Ostbevern, Nordrhein-Westfalen, Germany. He arrived in America on 27 Oct 1834, and made his way from the Port of New York to McLean Twp, Shelby County in Western Ohio, where he raised a family and farmed the land until his death in 1876. 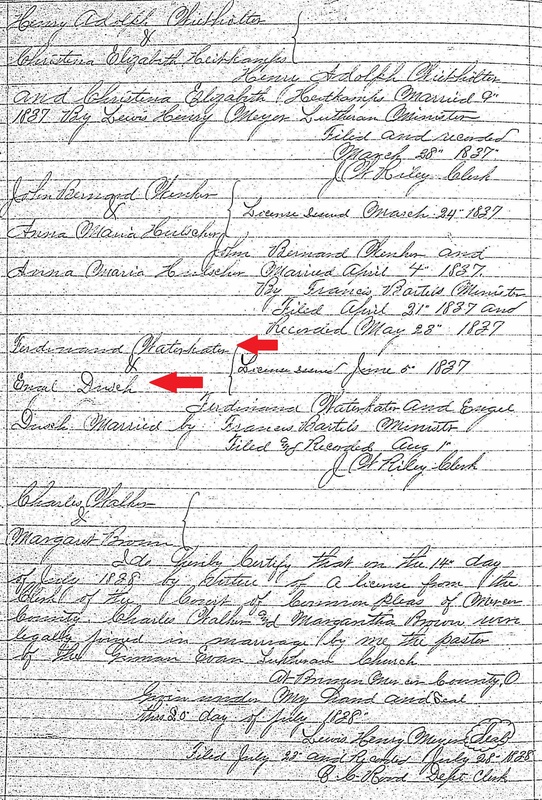 When Ferdinand immigrated to the U.S, he, whether intentionally or unintentionally, changed his name almost right away, at least on non-church documents. His 1837 county marriage record lists his surname as 'Waterkater.' 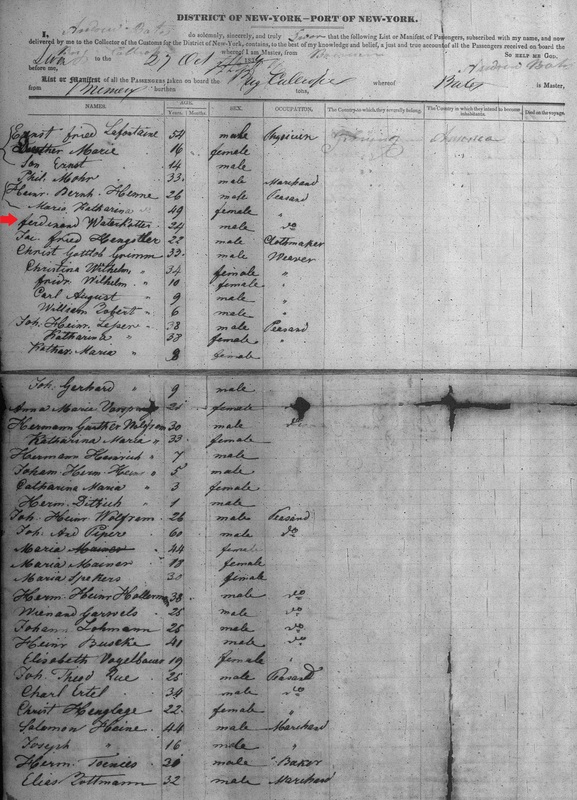 He is listed as Watercutter on his 1834 ship manifest and his 1844 Declaration of Intention also says Watercutter. And since Ferdinand settled in and raised a family in Ohio, it is not surprising that the U.S. occurrence of the surname Watercutter is still highest here, and particularly in the same county in which Ferdinand started farming his land 180 years ago. For fun, click this link, and then click on the small megaphone in the bottom left corner of the German box to hear how Waterkotte is pronounced in German. Then, I think you will understand how it became Watercutter. Thanks for putting this together. 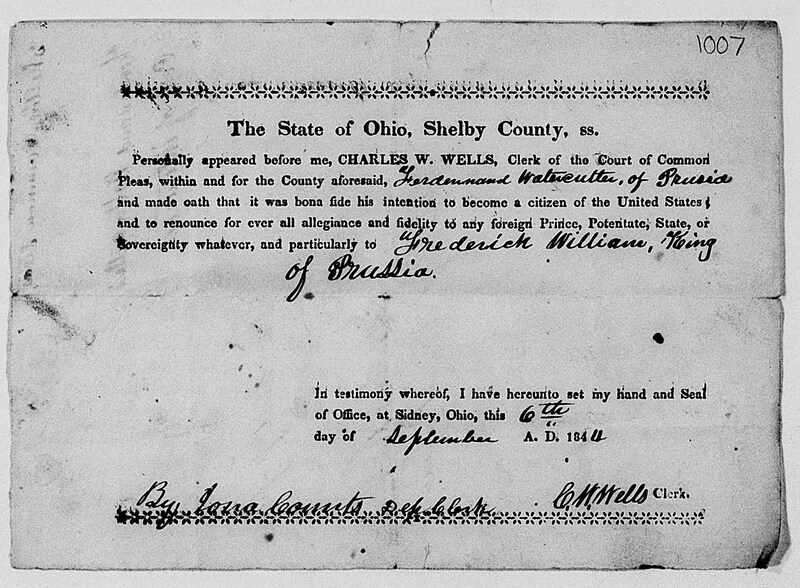 I grew up in Shelby county about 3 miles from where Ferdinand first settled. We farmed and my younger brother still farms today on it has been in the family since around 1885. It was interesting to see. Please contact us at the above email. My wife is a Watercott. We have traced the family back to Recklinghausen-Munster area in Germany. We are related to the Watercott's line that was in Henry, Ill, but not the Waterkotte line in Peoria, but we presume we are.